Thomas Gowing felt the mighty yet fragile English Beard to be threatened with extinction by an invasive foreign species, the Razor. So he set out to defend the furry face mammal in every conceivable way. 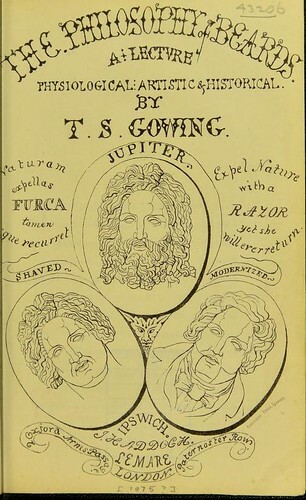 The resulting lecture was received so enthusiastically by a bushy-faced audience in Ipswich that it was soon turned into The Philosophy of Beards (1854) — the first book entirely devoted to this subject. Read it in full at the Internet Archive; or buy a hard copy of The Philosophy— The British Library republished it in 2014, for the first time since 1854. 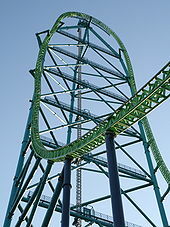 As we hail the hirsute, we might recall that it was on this date in 2005 that Kingda Ka opened at the Six Flags Great Adventure Park in Jackson, New Jersey. The world’s tallest roller coaster (and the world’s second fastest roller coaster), it offers riders an experience that lasts 28 seconds… during which the roller coaster cars are “launched” to a speed of 128 mph (in 3.5 seconds). At the end of the launch track, the train climbs the main tower (or top hat) and rolls 90 degrees to the right before reaching a height of 456 feet. The train then descends 418 feet (straight down through a 270-degree right-hand spiral. The train climbs a second hill of 129 feet, producing a brief period of weightlessness, before descending, turning toward the station, and being smoothly brought to a stop by the magnetic brakes.